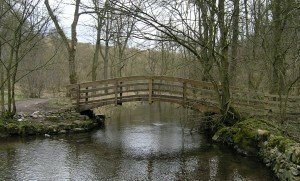 Altham Oak’s bridges, built to eye-catching standards of high-quality, are created employing traditional construction and engineering techniques, often centuries old. 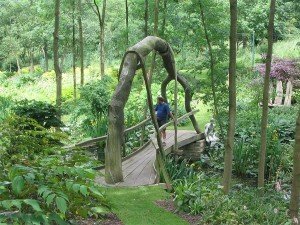 We specialize in arched beams whch we produce from naturally curved trees so that the grain of the finished beam follows the curve. This maximises the strength of the arched beam. Thank you very much for your invoice……. and erection of the “Monet” bridge at Snowdenham House Gardens. I am pleased to say that I have seen the finished article, which looks fantastic and which I know Mr Clarke is delighted with. In creating center-piece bridges that are designed to be as functional as they are beautiful, we consider several factors including user group demographics, frequency of use, material sourcing and initial design brief. The first photograph on the left shows a bridge in the Peak District National Park in Lathkill Dale. 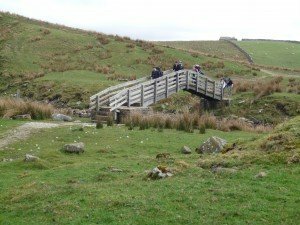 The second photograph shows a bridge located in the Yorkshire Dales National Park on the Yorkshire Dales Three Peaks route at Netherlodge. 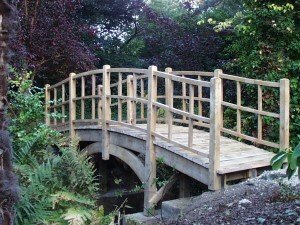 For bridges designed for use on private or restricted access property, we employ the same high levels of attention-to-detail and professionalism. We can be more inventive with private access bridges e.g. our weeping oak bridge.